Close to two months after Coal India Ltd (CIL) said it was not in the business of imports, the chairman designate of the world's largest coal mining company is looking to revisit the option. S Narsing Rao, who takes charge as CMD in two weeks, will do what it takes to meet the presidential directive if the production falls short of demand. "To meet the demand, if we have to step up production, we should do that. But, if there is a quantity shortfall - with the production target of 464 million tonnes this financial year, it is likely to be - we may have to go for imports," Rao told Business Standard, days after a directive mandated CIL to supply coal at 80 per cent commitment level to power companies. 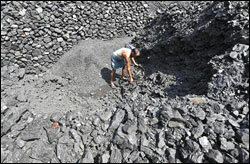 The presidential agreement came after the CIL board - even as it agreed to sign fuel supply agreements with power companies - turned down a directive by the Prime Minister's Office (PMO) asking the coal miner to live up to its 80 per cent commitment. The presidential directive, however, provided some relief to the coal mining company by giving it the freedom to relax the 10 per cent penalty clause. Backing the government on the issue, Rao said: "In my personal view, if the government gives orders to supply coal, a state-run company would be bound to do that. I don't think it would be a demon-like situation. For CIL, the biggest challenge is to meet the demand-supply gap and we will have to do every possible thing to meet the customers' demand." Importing coal may, however, drag the bottom line of CIL, given that the commodity globally follows the gross calorific value (GCV) and is much higher than domestic pricing. The company recently rolled back prices after widespread protests from end-users on the GCV-benchmarked pricing. Rao said, to solve issues regarding pricing after the introduction of GCV, he is ready to open talks with all power and non-power sector players. "We need to sit with them and resolve this appropriately. All the other issues, including setting up for technologies like bomb calorimeters are just procedural." According to sources in CIL, with the presidential directive in place, it requires an additional 70-80 mt coal to fuel 20,000 Mw power required for plants in place till 2011. Keeping this in mind and to find a solution to the environmental issues faced by the company, he said: "My priority would be an increase in production and despatch. Rest are all in-house issues that will fall in place once we achieve higher production. From the current 435 mt, even if we reach the projected 464 mt, there may still be a shortfall. We have to rectify that. We can also talk and try to convince the Ministry of Environment and Forests on environmental issues." Rao, who is currently CMD of Singareni Collieries, got his offer letter yesterday and is expected to take charge within two weeks. However, Rao remained quiet on the move of The Children's Investment Fund's to take legal action against the Kolkata-based company. He said he was not fully aware of the issue as he is "not yet part of the board".